By dur, June 21, 2016 in The Workshop! The color in question is Duracoat's NWU light blue, which IMO looks the part of the 80's F-14 color. Once it's fully cured, I'm expecting it to wear a lot better than normal acrylic! I need to clean up the cockpit mask and do all the details of course (spraying on top of a not fully cured coat prevents full hardening..). What I think would really help this guy is some properly scaled decals from the Hasegawa low vis kit- if you happen to have the kit (or are good at vector graphics) please let me know! I'm otherwise scrounging about for generic f-14/f-18 decals I might be able to resize. P.S. : I could really use some advice on teh super/strike parts color!! I know I want them to be some kind of neutral gray, but I can't decide on whether to go darker than the valk's color or brighter. I'm thinking dark gray (like panzer schwarzgrau ish) might be cool, but I somehow feel the "almost whitish" color packs some modelers use just feels a tad more military. Or, I could just lather on the light blue love, but I think that might not look so great as it would probably start looking like a blob. Help me choose?! Ive thought about using Duracoat for toy paints. I'm interested to how this works out. have you considered a low temp bake for the paint? like 120 for a hour for curing and hardening? Ive used this stuff on real steel and airsoft before. that looks really good. Always a fan of low-viz. Question on the paint though, based on how long it cures and the original purpose, so it is much more scratch resistant? I couldn't help myself and started transforming it recently, since I knew I'd need to do a touch up on some areas anyways: even at 2 days cure, the finish is hard enough that it won't wear off, though the dull did change to shiny on a few parts that rub. Once it's fully cured, I'm going to transform a bunch of times, locate problem areas, and abrade those areas for better paint adhesion. When these firearm type paints dry, it becomes like a layer of ceramic and so is very, very much tougher than acrylic, which is essentially a thin coating of plastic. Again, even with the partial cure, none of the tabs is showing any paint coming off after putting it through Bat/Ger/Fighter several times. Hearing that. I want one but saw that I need AB and it is hard to source here. Can't believe I started this over 2 years ago- life gets in the way! I'm nearing the final stages now. In hindsight, the duracoat is great for the joint areas, but painting with acrylic is just so much easier (I picked a similar shade so that if it scratches, the duracoat underneath is a very similar color). I'm touching up the fast packs and a few funny paint areas: almost done. You can see that my fading is uneven on some of the decals: that's WIP (I dilute my base color with clear coat so I can spray it translucent- going for a very faded look on everything). You can also see that I messed up the modex number slant since I worked on it at 3 am: going to replace those. This is more like a suggestion for the Super/Strike Parts color. 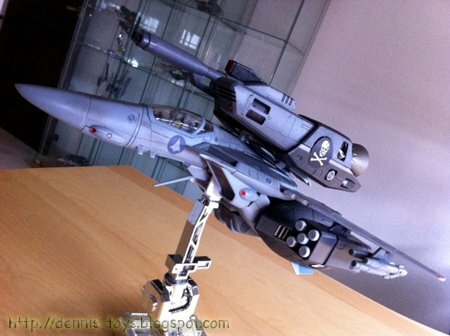 Some of the Yamato 1/48 VF-1 Low Vis owners they paired it with the available Stealth Colored Super/Strike Parts. It does look nice, I might say. I found this photos when I googled it. However, I'm not suggesting for you to do the same. Seeing that yours is lighter, I was thinking maybe you use the Stealth Colored Super Parts as a reference. Make the booster parts a little bit darker, and make the Strike Cannon the same shade of the grey you used on your VF-1. Same goes for the missile rack of the Supers. 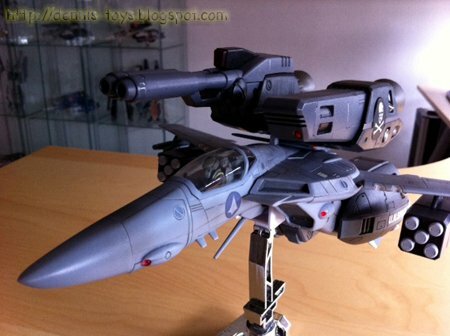 (Think of the Super Parts of Max's VF-1J from the HMR figure. But this time the blue portions are dark shade of grey.) Also, if it's not too much to ask, maybe you can lighten the shade of your grey on the nosecone just in case you don't want it to go white for it. And then, I saw this post only to realize I was suggesting something that you posted 2 years ago. Didn't saw the date on your posts above. So you can probably ignore my suggestion. Hahaha. This one looks great in grey. Love it. I've actually got the super parts painted already in dark ghost gray (to compliment the light ghost gray fighter), I just didn't try mounting them yet. After I clean up the paint fading (hopefully some time this week?) I'll do a quick photo shoot- got to transform it too to make sure the paint and decals survive! And yes, I'm definitely going to tint the nose cone lighter to represent a fighter that's been using its radar in combat (or at least on CAP) . I suppose it's not too late to change the super part booms/strike cannon, but I'm kind of losing steam on this build and will probably leave them dark ghost. So other than tweaking the "fade" and doing a final sanding of all surfaces in 1000 grit (just to give it that uniform surface look), and maybe a teeny tiny bit of lining/weathering, I'm going to call this one done. I've got a VF-25A and VF-0A on the workbench that need some love! All that being said, once I finish it, I am probably going to sell it: this is my last hi-metal R that I didn't want to sell incomplete, and I want to stick to 1/60. @dur - This is looking great! Looking forward to seeing this with the super parts mounted, and transformed to other modes.